I'm a sucker for beautiful Hooks. I know, they're just Hooks - just what you need to get a job done. But they're not. Especially these - beautiful Maple hooks with SERIOUS tips. 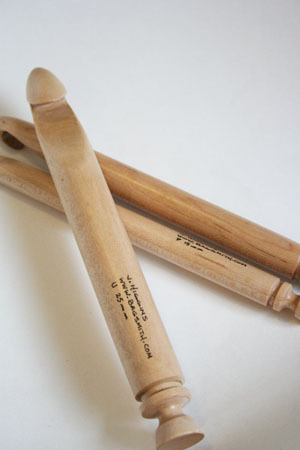 Our 9" crochet hooks are handmade of maple in Ohio. They are finished beautifully and feel great in your hand. The S and U can accommodate multiple fibers and are perfect for use with our Big Stitch Alpaca and Pagewood Merino yarns. These are great for the bulkiest yarns, especially the Bagsmith or Pagewood BUMP kind of yarns.... the yarns I love - cuz these Hooks can handle it. Beautiful to hold, with just enough traction to keep even the slipperiest yarns on the Hooks, these are great for hats, shawls, afghans. If you love Jenkins Circulars, check out their beautiful hand-turned Single Points!